Immature fruits falling off your tree early? Trees shed extras & optimize the rest! Join us for FREE guided flora & fauna nature walks in 2019! When: In 2019, meet us every second Saturday* from March – October (except as noted below) at the trailhead by 10am. What are these walks all about? Robin will lead a series of informal walks through the upland forests & meadows of the Padilla Bay Reserve and Breazeale Interpretive Center. Together we will expand our understanding of the flora and fauna that inhabit and contribute to the delicate balance here where the land meets the Salish sea. Healthy houseplants in a bright sunny window for winter. When spring and summer temperatures warm for day and night, many houseplants appreciate a little outdoor vacation for the season. Not only is this a great way to open up indoor spaces for summer, but it is also a beautiful way to decorate your front porch, decks and even garden beds. But, when your indoor plants go outside, they’re even more susceptible to various pests and disease. Not every pest or disease will be immediately apparent when you gather your houseplants indoors. Some of the most obvious and common issues we’ve encountered don’t come to life for a few days or even a few weeks after your plants are in the house. 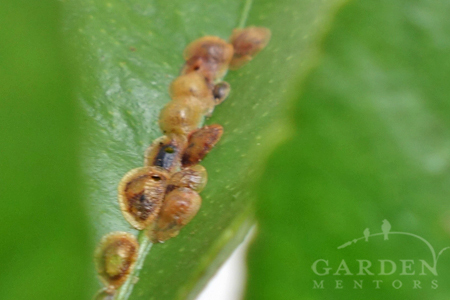 Scale: This is a pest that really gives us the willies, and it always seems to show up on our citrus trees within a week or two after the plants have been inside for fall. Look for raised lumps along the stem. They start out soft and easy to squish. Then, they harden up with a tough shell that’s hard to penetrate. Squishing can remedy it when young. Trimming out infected branches also works. You could also visit a local nursery for some of the other management options on the market. This is scale. Scale is nasty. Scale likes to live on all sorts of plants, but it really seems to love our lime tree. YUCK! Aphids: Yep these suckers often hitch a ride inside. Inspect the undersides of leaves before you bring in your plants and keep an eye out for fresh hatches soon after the plants come inside. Woodlice: Also known as pill bugs or rolly-pollies, these eaters of decomposition love to hide on the bottom of planters or just inside the drain holes. Knock them loose outside before you bring in your plants. Frogs: Okay, these aren’t pests, but they really don’t want to live indoors with you. Our native Pacific tree frogs tried to make many of our houseplants high on a deck their homes. Carefully, help them find their way outside where they know how to survive just fine all winter. Mold, Mildew & Fungi: You may find little mushrooms popping up in your houseplant, which shouldn’t give too much worry. But do clean up and dispose of leaf and other detritus in the tops of your planters to dissuade the growth of mildew and mold, which can readily spread to your beloved plants as well. 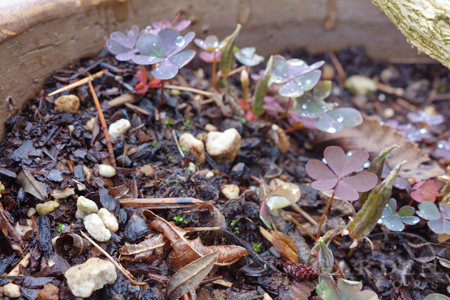 Weeds: Garden weeds love to set up shop in your container gardens. Be sure to winnow them out before you bring your plants in for winter. Clean up weeds & detritus before bringing in houseplants that enjoyed a summer vacation outdoors. Slugs: Slugs also hide in the wet, dark recesses of planting containers. Dig them free before you bring in your plants. Snails: You may find young snails hatching and climbing through your plants soon after they come indoors. Smash’m! There are any number of other houseplant pest issues that can pop up when plants move inside for winter. 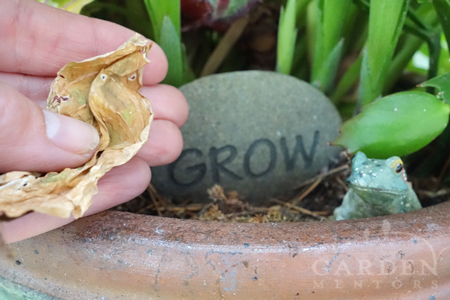 Picking over the plants, soil and containers carefully before you bring them inside is a good basic rule. Too, spraying any questionable foliage with a good jet of water may also knock back some of the more common problems like aphids. 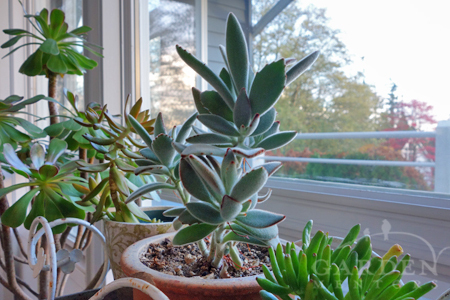 If your houseplants haven’t yet made the move indoors for winter, hurry up and get them inside soon. Wind, heavy rains and sudden temperature drops shouldn’t catch you by surprise this late in the season. Many ask how can I remove ivy from my garden? but there are better options than this invasive weed. 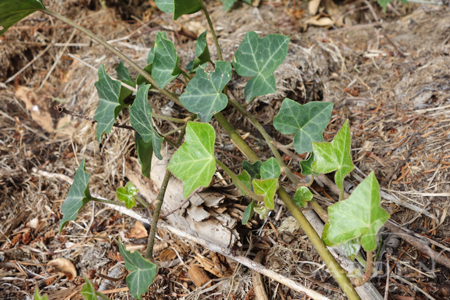 Depending on how much English ivy (Hedera helix) you have, where it is growing and how long it has been growing there, eradicating English ivy can be quick work or may take several seasons. There are many species of ivy growing, but the most insidious is common English ivy, which was likely introduced to “new world” gardens by the English who had cultivated this European mainland plant in their island gardens. Then, it spread quickly across the land. This adaptable plant will thrive in sun or shade and the cruddiest soils. 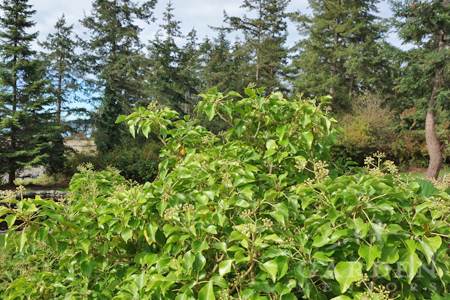 It can travel as a ground cover and create a climbing helix shaped woody vine, smothering everything it crosses — from the side of a house to a tender perennial garden to ancient forests. That bullying behavior qualifies it as a nasty weed in my book. In the foreground, mature ivy growing on the stump of a mature tree it helped kill. In the distance, large native Doug firs clothed in climbing ivy to remove. So, how do we eradicate it? To begin, just don’t buy it. 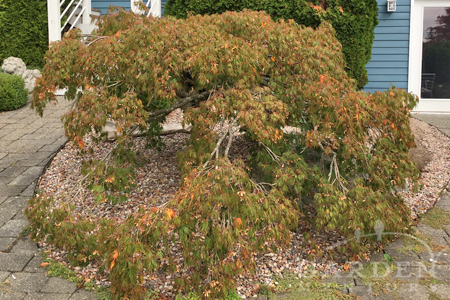 Early fall isn’t really the best time for Japanese maple pruning. But, I’ve been breaking rules like this and following the “do it when you can” way of life lately in order to try to get ahead of all of the renovation tasks needed on our new, large property. This dwarf Japanese maple looks awful. Limbs are overgrown beyond the bed lines & it looks sparse — probably as a result of growing under layers of landscape fabric & heat-building rocks. Time to do some Japanese maple pruning! It’s in that bed filled with overlapping layers of landscape fabric & roll-y poll-y rocks that I wrote about last week. A neighbor wanted those rocks & the maple was making moving them difficult. The maple looked like crap & desperately needed a bit of limbing up. Even though late summer/early fall isn’t the best time to prune deciduous trees, these cuts aren’t likely to deal a death blow to this tree. 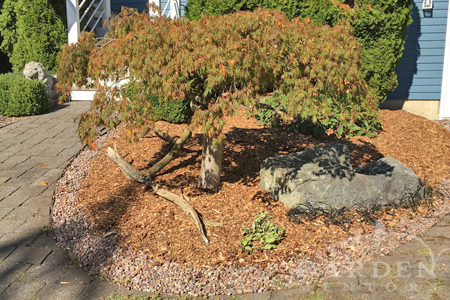 In fact, getting the landscape fabric and heat-holding rocks out of the way and adding a layer of arborist chips is likely to help the tree in the long run. So, I pruned out a lot of dead material and some living branches to give my rock-shoveling neighbor room to maneuver. Low and behold, my maple pruning unveiled a gorgeous greenish boulder with a small natural birdbath indentation! After removing a lot of landscape fabric & rock, pruning a few branches, adding a few plants & topping the bed with arborist chips, I could almost feel the tree sigh in relief. And doesn’t it look better?! Once my neighbor had shoveled all he could shovel in a day, I hauled out the last of the landscape fabric, keeping a narrow edge of pebbles for drainage between the bed and the paver pathway, added a few perennials in a couple of key spots, and I top-dressed the tired soil with arborist chips from tree work we had done earlier this summer. Later, as I was putting my tools in our woodland shed, I spied an old alder branch, which I added to the bed for interest — kind of driftwood meets nurse log look. Once the soil microbes work their way up in the soil profile, breaking it up along the way, to feast on the arborist chips and incorporate the nutrients into the root zone, I’ll add more plantings. But, there’s no rush. In fact, I’ll probably be doing more maple pruning (in winter) before I do anymore planting (next spring). When we lived in the city, stinky, loud gas-powered leaf blowers drove us nuts. Cheap, fly-by-night lawn companies seemed to constantly blow all sorts of crap throughout the neighborhood — never pulling out a rake to gather and dispose of whatever they blew into the gutter or onto the next door neighbor’s property. Raking is great exercise! 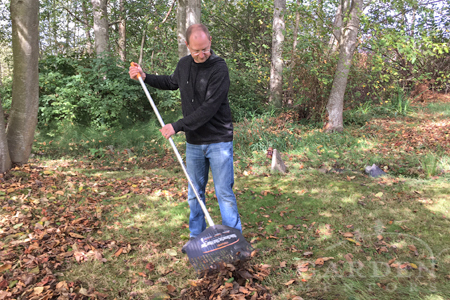 In small residential gardens, a rake is probably all you’ll really need to keep up with leaf detritus. When my elderly mom reported on her almost-daily leaf blowing chores, we were more appreciative of her use of leaf blower. She lived in a residential neighborhood. But, hers was on a slippery slope, in a deciduous forest that shed leaves for months. And, she used a relatively quiet electric, plug-in blower. She also used a rake to gather up her leaves to make compost. 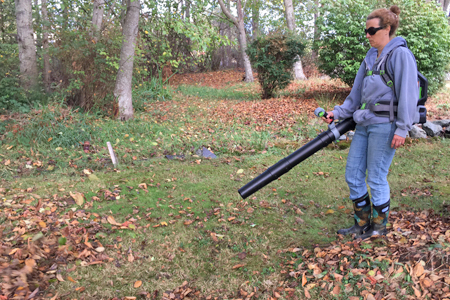 When you have acres of forest that sheds leaves from summer through fall, a leaf blower really helps keep on top of all the work. When we purchased a couple of partially forested acres with a lot of gravel paths, I knew we’d need to acquire a few gardening power tools. I really didn’t want to be mixing gas and toting around a heavy petrol-powered backpack blower. And, a corded electric blower would require a ridiculous number of extension cords. 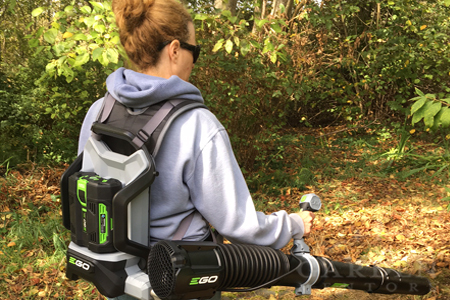 Fortunately, EGO brand just released a light-weight backpack blower with a rechargeable lithium ion battery. Battery powered leaf blowers are less polluting than gas ones. They don’t emit fumes & are much more quiet. Plus, they now come in lightweight backpack models! 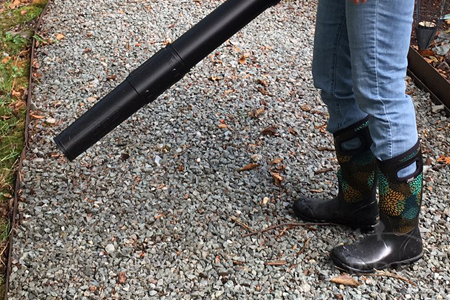 When using a leaf blower on gravel paths, take care to use low settings that don’t send gravel flying. Raking can work on gravel, but again, take care not to rake your gravel into your leaf piles. The manual recommended ear protection, but I found the machine so quiet that I took mine off, and my ears weren’t ringing when I was done. I did bind up my long hair, wear tall boots, long pants & big sunglasses for body protection. I had garden gloves on most of the time too. My back wasn’t tired or shaky and my weak hands weren’t aching after blowing leaves for a couple of hours two days in a row. And, yes, it will blow for a few hours at a time — if you use a low setting. If you put it on high or use “turbo” often, it will run out of juice quickly. But, it will recharge quickly too. Whether you rake or blow, be sure to save your leaves for creating luscious compost! Raking up stray leaves or mounding them into a compost heap is the perfect job while we’re waiting for that battery to recharge. Rakes are still an important part of our tool arsenal, but getting up mountains of alder and other leaves just wasn’t going to happen without a little Ego boost (pun completely intended). 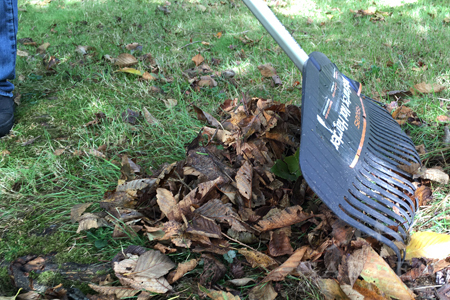 In the meantime, get out there and start gathering up your fallen leaves. Once those leaves pile up and get soggy, getting them relocated to your compost pile will be a lot more difficult — whether you’re raking or using a power tool. Rake early. Blow often. And, keep those manna-from-heaven leaves to feed your compost-hungry soil! Big, mature trees are going down hard this summer. Blame the drought last summer, blame a bunch of bugs, blame climate change or just get past the blame-game and start watering your stressed out big trees. 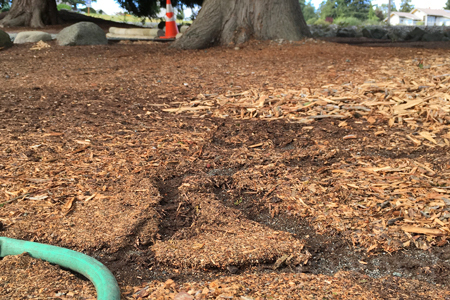 Slow, deep, repetitive watering under the cedars may help them through the summer. Just try not to soak the trunk of the tree while you’re at it. For years horticulturists and arborists have been coming to terms with the idea that we’re going to eventually lose many of our native trees. One of the first we expect to go is our beautiful western red cedar or Thuja plicata. And, other natives will probably follow this beauty’s lead. 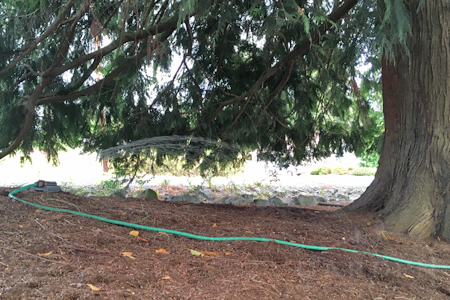 Recently, we hired New Leaf Arboriculture to help us with some of our biggest tree concerns, one of which was an enormous, multi-leader western red cedar. This gorgeous tree has lived through quite a bit of change, particularly in the last few decades. As recently as the 1980s it was one among many trees in an undeveloped forested wetland. Kids had a tree house in it during the 1960s and 1970s. Then, in the 1980s, much of land was cleared around it. And, eventually a large building was constructed adjacent to it. Then, because runoff had become an issue, much of the water that it (and its remaining neighbors) relied upon was rerouted into a county ditch. And, the ground above its uptake roots was carpeted in water-diverting beauty bark. It’s no wonder this tree was struggling! 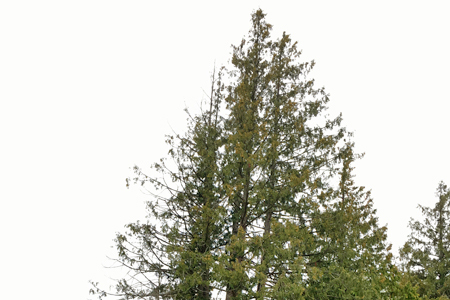 Sparse green growth on the tops of these cedars indicates stress. So, the hose dragging has begun. It’s going to take a while to get a good amount of moisture to those feeder roots living inside a beauty bark prison, but by watering slowly and deeply and repetitively over the next several days, we hope to build a decent layer of moisture for this big beauty and two other western reds just up hill from it. It may take quite a bit of water, but frankly its worth the investment. And, once we build up a moisture layer, we’ll have to keep watering on occasion so that the feeder roots don’t dry out again during the long, hot, dry days that seem to be lasting later each year. Skip watering the dumb lawn. Let it go brown. But, don’t let the tips of those cedars brown out, indicating it’ll soon be a goner. This time of year many conifers do go through shedding some older leaves, and they can look a bit more sparse because of it. But too much loss means worse things to come. As cones on these Thujas turn golden in summer, after being green in spring, the transition can add on to the stressed look. Plus, heavy cone set can indicate that the tree is really stressed out. Cones = seeds, and a tree putting out a lot of seeds may be trying to replicate itself that way as a last ditch survival effort. 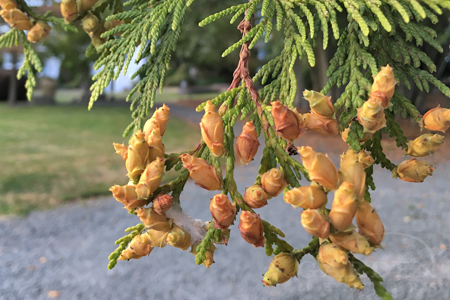 Heavy cone set like this on a Thuja plicata can indicate the tree is extra stressed out. If your soil is dry, water. If the tops of your trees are sparse, water. If your big trees have heavy cone set, water. If your big trees are more yellow or brown than green, water. And, if in doubt, bring in an arborist for help evaluating your situation and setting a course of action toward preserving your precious trees (and costly investment) before it’s too late.